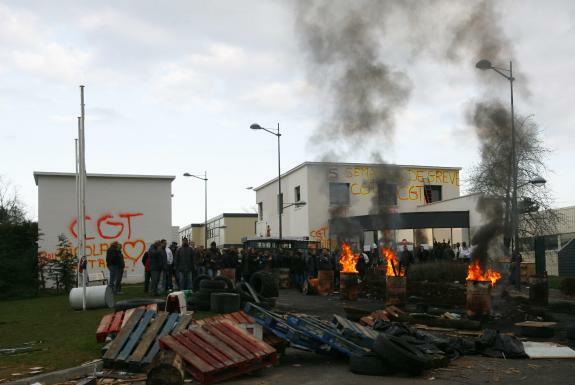 After an occupation and strike lasting over six weeks workers at the FCI Microconnections in Mantes-la-Jolie have saved their jobs. The strike began on February 24th with workers demanding assurances on their future. Management refusal to give information on production at an equivalent factory in Singapore and an announcement that there was 'overstaffing' led workers to believe that the company was planning to shut the factory down and shift production. Over half of the factory's 400 workers occupied the factory to prevent any removal of equipment. Workers held the factory and picketed for seven weeks, in spite of a legal order to quit the premises issued on the 26th of March. 100 workers responded by going to the company headquarters in Versailles and blockading the chief executive in the building for four hours to demand negotiations. Management continued to deny that any redundancies were planned until the CGT uncovered a document detailing a redundancy plan for November on the 3rd of April. This increased support amongst the workers, especially the non-strikers. A week later after negotiations between the CGT and CFDT unions and management, mediated by the region's sous-prefet and the work and employment bureau, an agreement was announced. The workers had succeeded in winning a guarantee that the factory would stay open until 2014 with no job losses before 2011. Workers also won payment for 27 of their 34 strike days.